"Gov. Linda Lingle, the ship's sponsor, and U.S. Sen. Daniel Inouye will represent Hawaii at the blessing. Retired Hawaii Army National Guard Master Sgt. Raymond Ganotise will give the blessing. Also in the audience will be Adm. Gary Roughead, Pacific Fleet commander." "At 7,800 tons the Hawaii also is lighter than a 8,100-ton Seawolf-class submarine. 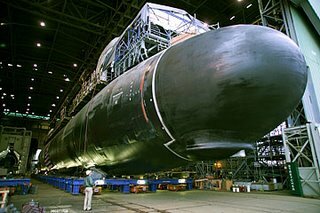 Six Virginia-class submarines are contemplated, but so far only one, the USS Virginia, is in service, with the USS Texas expected to join the fleet next month." I probably shouldn't be too hard on these reporters who don't normally cover submarines, but if you're going to put information down, why not make it correct? For the record, Seawolf-class boats displace 9,100+ tons (with SSN23 displacing more) and there are at least 10 Virginia class boats planned. Who could protest against something so pretty? Update 2325 14 June: Here's the DoD press release on the christening. Just a guess, blessing is the PC version of christened. The word's root word might offend someone. No, they use the term 'blessed' in context of the polytheistic religion the Hawaiian's have. 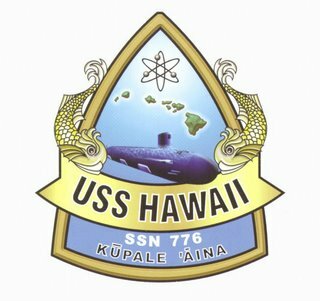 I hope the people that bless the USS HAWAII aren't the same ones who bless the road designs in this state- otherwise the HAWAII is in for a short operational life span. Technical question. What is the round thing on the bottom of the bow? I was suprised the bow did not go back smooth along the keel. Does that not make noise/ less speed? I have no idea -- might be plastic wrap they've taped onto the bottom of the sonar dome to cover a still-open access hole that'll be welded up soon. You're right that such a bump would really make a lot of flow noise and slow the ship down (even more than Virginias are already slow). I attended the ceremony (my son's an MM3 nuke3 aboard). The protesters turned out to be a little old lady handing out leaflets near the main entrance. Not disruptive at all. As for the use of the word blessing, in an odd case of accuracy winning out over political correctness, it actually was a blessing! A retired Hawaiian MSgt said a prayer in Hawaiian over the boat at the end of which he pronounced that 'this war canoe is free of taboo.' It was actually a pretty cool part of the ceremony. The political folks maintained a common theme among each other that they want the Navy to ramp up demand to 2 Virginia's per year. That, and 'thanks' to Hawaii for the generations of sailors who sailed out of Pearl Harbor. That round thing at the bottom of the bow is a CHIN Array. It doesn't make any flow noise.